History of Chevening House, Sevenoaks Kent. The Chevening estate can be traced back to the early thirteenth century when it is first referred to in contemporary documents. After passing through many hands in the Middle Ages it was acquired by John Lennard in 1551 for £420. The Lennards, who became Lords Dacre of the South by marriage in 1604, owned it for eight generations and were responsible for building the present main block of the house. The House was built by the 13th Lord Dacre (died 1630) between 1615 and 1630 to a design once attributed to Inigo Jones. The house and estate were bought in 1717 by General James Stanhope (1673-1721), confidant of King George I and later his Chief Minister, who was created 1st Earl Stanhope in 1718. In 1720 Stanhope added projections on the east and west sides of the house, built the two pavilions and quadrants which join them to the main building and enclosed the forecourt with an elegant wrought-iron clair voyée of local manufacture. He laid out the formal garden around a long canal, planted a triple avenue to the Pilgrim’s Way and extended the Upper Park. The 3rd Earl (1753-1816) had an unusually fertile mind. In the latter half of the 18th Century he designed the first iron printing press, invented a machine to do multiplication and division, experimented with steam propulsion for warships, planned canals and advocated the development of railways. His ideas for the house were more controversial. In about 1780 the bad state of repair of the house led the 3rd Earl to make alterations, which, sadly, removed much of its original beauty. The mansard roof was removed and replaced with a top storey with perpendicular walls and a flat roof, and the major part of the walls of the centre block were encased with overlapping “mathematical” tiles which were nailed to the walls with iron pins. These eventually rusted, ruining the brickwork. The thermometer shaped canal was transformed into an informal lake and the sweeping Chatham Drive was built. The 4th Earl (1781-1855) inherited “a dilapidated and decayed house standing in a hayfield”. Between 1817 and 1821 he spent £4,824 15s 5d on essential repairs, but his main interest lay in the garden and woodlands. He laid out Italian gardens in front of the house and the parterre on the west side. His son, Lord Mahon, designed the maze. The 4th Earl also re-opened the rights of way through the estate previously closed by his father and opened the gardens to the public. The 5th Earl (1805-1875) modernised the house, putting in gas and sanitation and installing heating apparatus in the halls and passages. The upkeep of the estate continued to be a serious drain on resources and the 6th Earl (1838-1905) sold Irish and Buckinghamshire properties. The 7th Earl inherited the family estates in Kent, Devon and Derbyshire in 1905 but soon sold off the bulk of those outside Kent. In 1908, following service with the Regular Army and his regiment, the Grenadier Guards, he undertook a long tour of Canada and the United States, for which countries he developed a particular admiration. On the outbreak of the First World War he rejoined his regiment and served in France where he was awarded the Military Cross and the Distinguished Service Order. His only brother, Richard, was killed during the battle of the Somme. 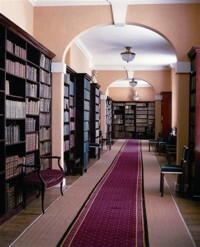 Following the war he joined the National Government serving at the Admiralty, the War Office and at the Foreign Office. He was appointed a trustee of the National Portrait Gallery, like his grandfather before him. King George V conferred on Stanhope the Order of the Garter in 1934. That same year he finally succeeded in establishing the National Maritime Museum at Greenwich. In 1936 he achieved his ambition of securing a Cabinet post as First Commissioner of Works where he had a major responsibility for organising the coronation ceremonies of 1937. In 1938, Stanhope returned to the Admiralty as First Lord where he selected personally those senior officers who were to hold the key naval commands at home and abroad during the Second World War; perhaps his most important contribution to the nation. 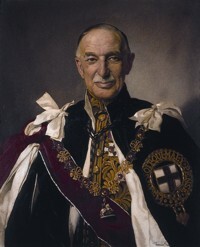 On the outbreak of war Chamberlain appointed Stanhope Lord President of the Council. This was to be Stanhope’s last office for, on the fall of Chamberlain’s government in the spring of 1940, he withdrew from public life. His wife, Eileen Stanhope, died that autumn of cancer. In furtherance of a decision he had taken soon after the death of his wife and realising the advantage provided to the Prime Minister by the gift to the nation of Chequers, Lord Stanhope decided that the facilities at Chevening could offer a future Cabinet Minister similar advantages. He arranged for Chevening House and the estate to pass on his death to a trust and thus be preserved for the nation in perpetuity.